GHIS Web Design Student Portfolio - É.A.D. Links to my Projects completed during the course. Click on the pictures to view the web page/site. 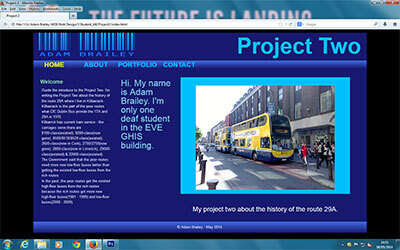 I made the Project 1 website about the buses. The CIE was founded in 1945 until break up in 1987. The low-floor buses delivered to Dublin Bus between 2000 and 2009 and serve the rich routes. The poor routes use the high-floor buses between 2000 and 2012. Few new low-floor buses were removed from the poor routes and put on the rich routes and never return to the poor routes again. Between 2012 and 2013, more new low-floor buses delivered to Dublin Bus. The governments, news and newspapers said that the new low-floor buses are needed for all poor routes only because all rich routes have existed low-floor buses. Dublin Bus had 1038 low-floor buses but now has 920 because 3 lost in the accidents and 115 unlawfully transferred to other activities. 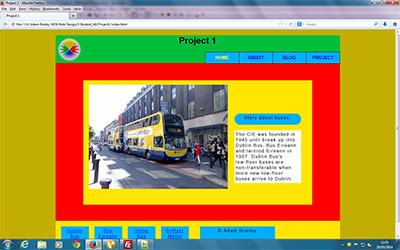 I made the Project 2 website the history of the route 29A where I live in Kilbarrack. Kilbarrack is the part of the poor routes what CIE Dublin Bus provide the 17A and 29A in 1970. The governments put the new low-floor buses to the poor routes only after the high floor buses left service with Dublin Bus in 2012. The rich routes have existed 00-reg to 09-reg low-floor buses and they stole the 12-reg and 132-reg low-floor buses from the poor routes and never give back to the poor routes. Kilbarrck has current Dart train service. In mid 2014, Dublin Bus's 859 2-axle low-floor buses will be grounded on most rich routes and 70 3-axle low-floor buses will serve the poor routes with 65 more 3-axle low-floor buses shortly. 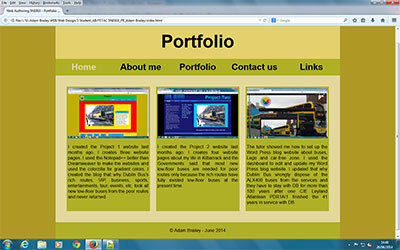 I created the Portfolio website exams what the company want them. I chose the gold colour for the clients who want the best colour. I put three selection boxes on the Home page. I put four photos into the Portfolio page. I decide to keep the HTML and CSS sheets safe for next website projects.